BJP on Saturday asked the leaders from opposition parties to be mindful of their language while making statements on the armed forces. "You have seen today that (National Conference leader) Farooq Abdullah who is part of the adulterous alliance is making anti-India remarks every day. 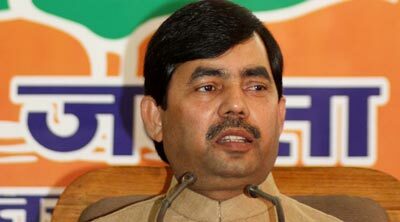 Rahul Gandhi and Congress should reply whether they agree with Farooq or not," BJP spokesperson Shahnawaz Hussain said while addressing a press conference here in the capital. "If they don't agree, then they should condemn it and disassociate themselves from the remarks made by Farooq Abdullah," Hussain added. "BJP strongly condemns remarks made by Farooq Abdullah. Please mind your language when you are talking about the brave jawans," he said while asserting that politicisation of the jawans killing causes hurt to the 130 crore people in the country. Hussain's comments come in the wake of National Conference (NC) leader Farooq Abdullah claim on Saturday that the incumbent ruling government is merely "beating the drums" in the name of the Balakot air strike. The NC leader scoffed at BJP's claim of killing hundreds of Pakistani soldiers across the LoC and called it "fake". Terming All India United Democratic Front (AIDUF) leader Badruddin Ajmal as the 'B' team of Congress, the BJP spokesperson said, "Ajmal said that after elections he will send our Prime Minister Narendra Modi and BJP president Amit Shah out of the country. Badruddin Ajmal is the leader of infiltrators." "Everyone knows that Ajmal's politics runs only on the fact that he shelters Bangladeshi infiltrators, protects them and speaks for them. His party is known as an organisation for the Bangladeshi infiltrators," Hussain said. Training his guns at Samajwadi Party leader Azam Khan, the BJP spokesperson said, "I also want to tell Azam Khan, please mind your language. It is because of your tongue that people of UP taught a lesson to Mulayam Singh Yadav and Akhilesh Yadav." "He wants to create communal tension in the country. Azam is changing the name of "Bajrang Bali" to "Bajrang Ali". What kind of language is this?" he questioned. The BJP spokesperson accused the SP leader of insulting Hindus as well as Muslims and questioned why Jamiat Ulama-i-Hind and Darul Uloom Deoband who kept commenting on every issue were silent on these remarks. Commenting on the first phase of polls, Hussain said that the rival parties have accepted that people will make Narendra Modi the next Prime Minister of the country. "They have accepted that people will make Modi the next Prime Minister and we are getting support from all communities for this," he said. The BJP spokesperson also alleged that all remarks made against Prime Minister Narendra Modi and Amit Shah were being made at the behest of Rahul Gandhi. Accusing Rahul Gandhi of contempt of court for his statements on a recent judgement in the Rafale deal, he said: "Meenakshi Lekhi has filed a contempt plea and we are hopeful of getting justice on that." He also urged the party to stop spreading rumours and prepare a reply for the contempt notice. The BJP leader also alleged that Congress is looting the money of children of the poor. "The party which talked of NYAY and poverty, today wants to loot the money of children of poor. "Tughlaq Road Scam" is happening and Congress is not giving an answer to the poor people," he said. Hussain was referring to the money recovered from the recent I-T raids in Madya Pradesh. Reacting to reports that Congress might field Priyanka Gandhi Vadra from Varanasi, he accused the Congress party of spreading rumours. "Our Prime Minister is contesting from Varanasi and he will win with a bigger margin this time. It is true that no candidate is being found to contest against him." Commenting on Digvijay Singh's remark on donate land for a Ram Temple in Bhopal, he said, "What has happened to Digvijay Singh? He knows Kamal Nath has trapped him. Now he is visiting temples and Mazars. Ram Mandir will be built in Ayodhya." Reacting to BSP chief Mayawati's remarks in Deoband, Hussain alleged said, "She has made communal remarks earlier too. She got out on zero last time and she will be there this time too. We will go from 73 to 74 while she will go from zero to minus zero." He urged the Election Commission to take notice of such remarks. "When Yogi Adityanath makes a statement, it is taken cognizance but Mayawati is making such remarks on a daily basis to polarise. It means she is accepting that she is not getting votes from that community. When she did not get votes on giving 100 tickets, then what will she get now?" he questioned. Reacting to the Congress jibe on Smriti Irani, the BJP spokesperson said, "Amethi MP (Rahul Gandhi) went to Waynad as soon as Smriti landed in Amethi. There too, Rahul is not in good condition. Priyanka Gandhi might have to visit there." "So much abuse and hatred against Smriti Irani is indicative that this time the lotus will bloom in Amethi," he said.